A quote tattoo that uses thick line work with a serif font, all lowercase and black, to give a bold impact can really make an aesthetic statement. It is in a highly visible area of the forearm, which allows for a daily personal reminder of its meaning that also makes it stand out vibrantly. Quote tattoos using words or text only are an art form onto itself—from choosing the font to its placement and spacing, all these details come together to form a tattoo that can be breathtakingly beautiful and capture many emotions through it. 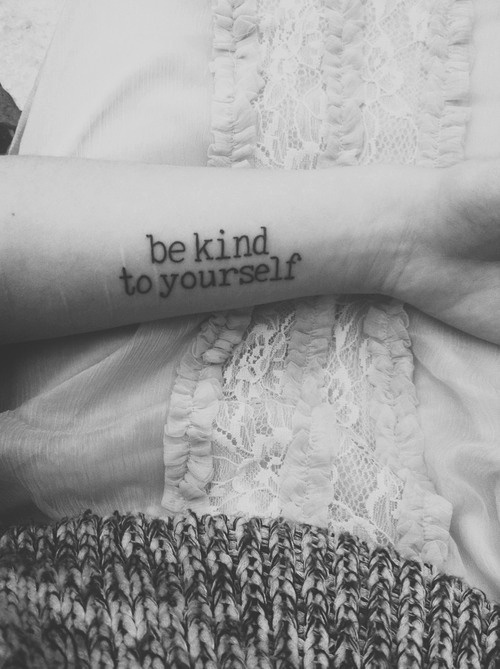 “Be kind to yourself,” in particular, can be a personal reminder or it could serve as a reminder to others who struggle daily. The involving nature of quote tattoos invites viewers to apply its meaning to themselves or to interpret it in their own way—but also serves as a unique personal experience.